SteamWorld Quest is the roleplaying card game you’ve been waiting for! Lead a party of heroic steambots through a beautifully hand-drawn world and intense battles, using only your wits and a handful of cards. Take on whatever threat comes your way by crafting your own deck, choosing from over 100 unique punch cards! 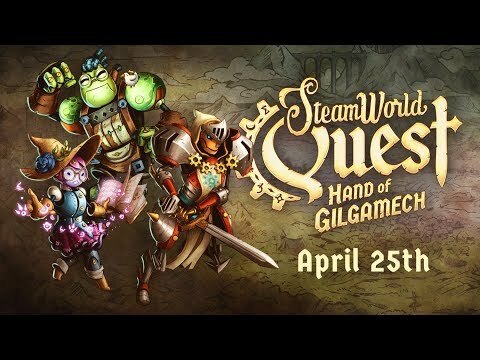 SteamWorld Quest: Hand of Gilgamech was released on Switch 20h ago in the US and the UK. The upcoming SteamWorld Quest: Hand of Gilgamech PC, PS4 and Xbox One release date is 2019 in the US and the UK. Notify me when SteamWorld Quest: Hand of Gilgamech is available.